Caption slip reads: "Photographer: Gershon. Date: 1958-06-05. Reporter: Gershon. Assignment: Yacht cruise. Yacht Lua, 33-foot ketch, in which Clark and Carole Scarboro will cruise South Seas. 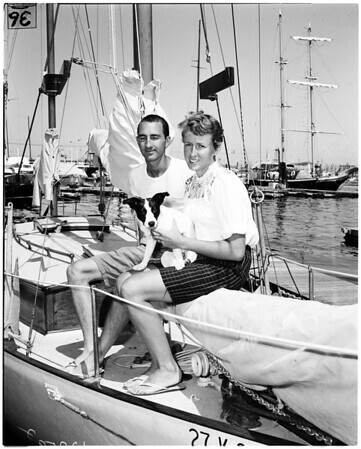 Clark and Carole Scarboro and mascot Fox Terrier "Algae" on board 33-foot ketch Lua they will cruise through South Seas".